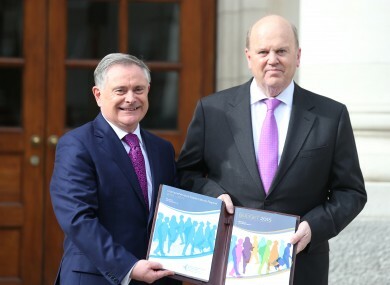 IT’S BEEN LABELLED as the first non-austerity Budget in almost a decade with some measures announced to reward the Irish people for their ‘incredible effort’. Finance Minister Michael Noonan revealed how his department plans to raise funds in taxes, while his colleague in the Department of Public Expenditure and Reform explained how he intends to spend the money that is available. The entry point to the USC has been raised to €12,000. This will mean about 80,000 low-income workers will be removed from the charge altogether. Increase in the entry point to the 3.5% rate from just over €10,000 to just over €12,000 and the upper ceiling on that rate will move from €16k to just above minimum wage. Increase of €1,000 to €33,800 for the single person’s income tax standard rate. 9% VAT rate for the tourism sector has been retained. These lads will be happy, at least. The 0.6% pension levy will be abolished at the end of 2014. The additional 0.15% Pension Levy for 2014 and 2015 will expire at the end of 2015. The 12.5% corporate tax rate will not change. A Knowledge Development Box will be introduced for companies, based on similar Patent Boxes that are seen in other economies, such as the UK. This allows companies to benefit from corporate tax exemptions on innovations. Learn more about it here. The Double Irish loophole will be abolished from 1 January 2015 for new companies, with existing firms getting a transition period until 2020. Extension of the three-year corporation tax relief for start-up companies. A packet of 20 cigarettes will increase by 40c tonight. Roll-your-own tobacco will increase by 20c tonight. There are no changes to alcohol excises. More relief for micro-breweries which will get more excise relief production capacity. There are no changes to motor tax, petrol, diesel or VRT. Income tax relief on the standard rate will be available up to a maximum of €500 per household. This will work out at about €100 back to households every year on what they are paying on water charges. Incentives to encourage long-term leasing of land such as the removal of stamp duty on agri leases over five years and removing the current 40 years of age threshold for leasing relief. There will be help for farmers who have a second job to supplement agri income. Changes to VAT registration for farmers. Extension of farm restructuring support. Has been maintained and extended to include those in the rental market. It will apply to work done by the end of 2015. Removal of the 80% windfall tax on disposal or development of land which has been in the planning system since October 2009. This comes in next 1 January. Removal of the Capital Gains Tax relief by end of 2014 on purchase of property – it’s “no longer needed”, according to Noonan. First-time buyers will get a refund on DIRT on savings used to purchase homes (up to 20%) up until the end of 2017. The new Irish film tax credit scheme is due to commence in 2015. There are hopes to increase the €50 million cap in 2016. Improvements in the Foreign Earnings Deduction. Expenditure will be €50 billion, with social protection, education, health, justice and social housing benefitting. €210 million increase in the country’s capital spend. €2.2 billion will be spent on social housing in the next three years. 2,500 of the 6,700 units are due to be delivered in 2015, when €800 million is invested. An additional €10 million will be provided for accommodation and related services for homeless persons, bringing amount to €55.5 million. Public Private Partnerships will be used to invest €300 million into social housing units by 2017. Will increase by €5 per month per child (to €135) from January 2015. Provided circumstances allow, government says it will increase child benefit again in 2016, by a further €5. €8.3 billion allocated, the first increase since 2008. No changes to class size. An extra 1,700 teaching posts – including 920 mainstream teachers, 420 new resource teachers and 365 new special needs assistants. An extra allocation for Heather Humphries as Arts, Heritage and the Gaeltacht is awarded €212 million. €13.1 billion for the delivery of Health services in 2015. €3 billion for older people and disabled services. The Living Alone Allowance will be increased to €9 per week, benefitting about 180,000 older people. All recipients of the Household Benefits Package will receive €100 payment towards their water bill. Social welfare recipients will receive a 25% bump in their holiday week payment in the form of the Christmas Bonus. The moratorium on recruitment has ended and recruitment will begin in a ‘focused and targeted’ way next year. €19.4 billion has been given to Social Protection. There were no reductions to any Social Welfare payments announced. €2.2 billion allocation to the Justice sector. Again, it’s the first budget increase since 2008. JobsPlus scheme to get another 3,000 jobs. A Low Pay Commission will be established. A new border counties peace programme will be funded. €600 million for development and humanitarian aid. Email “The main things you really need to know from Budget 2015”. Feedback on “The main things you really need to know from Budget 2015”.